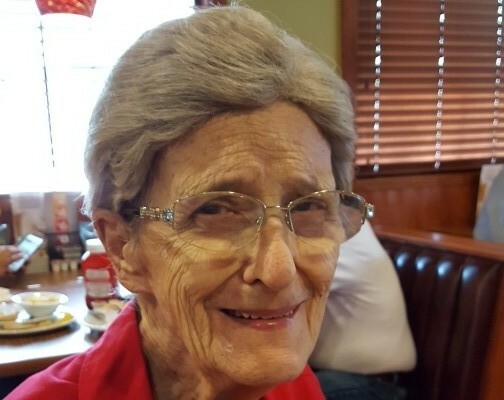 Betty Jane (Coppess) Loven, 94, beloved wife, mother and grandmother went home to be with her Lord, on Friday, November 23, 2018 at La Hacienda Nursing Home in Harlingen. She was born in Indianapolis, Indiana on July 10, 1924 and moved to Harlingen when she was 21. She met Bill Loven while working for the Soil Conservation Service and they married in 1946. She was very active at the First Baptist Church in Harlingen for many years where she played the organ and sang in the sanctuary choir. She also sang with the Harlingen Civic Choir for many years as well. Betty is survived by her three daughters, Janie McKee of San Marcos, TX, Judith Anne and Jack Mahurin of Los Fresnos, and Jeanne Marie and Larry Stewart of Harlingen. She was extremely proud of her 9 grandchildren, 17 great grandchildren, and 1 great great grandchild. She was preceded in death by her husband, Bill Loven, daughter, Joanna Sue Loven, and great grandchildren, Joseph (Joey) Michael and Clarissa June Mahurin. Visitation hours will be held from 1:00 PM to 9:00 PM with the family present from 5:00 PM to 7:00 PM at Buck Ashcraft Funeral Home on Tuesday, November 27, 2018. Graveside funeral services only will be held at Restlawn Memorial Park, 11:00 AM, Wednesday, November 28, 2018. Pallbearers will be family members Jerry McKee, Jeffrey McKee, John David Mahurin, Joseph Mahurin, Derek Stewart, and Dillon Stewart. Those desiring to do so may make memorial donations to Kindred Hospice, 3350 Riverwood Parkway, Ste. 1400, Atlanta, GA 30339.